Home > Chair > Varier Move Stool Review – Is It Still Reliable? The Varier Move Stool offers tilting and 360 rotation. It is used for upright sit-stand purposes with the aim of strengthening the core and ultimately improving the posture. Designed in Norway in 1985 and made in Poland, the Varier Move Stool is one of the truly ergonomic designs in its class. It comes to meet the needs of those looking for anatomically-correct stools. They are among the solution considered to be comfortable. But at the same time, ergonomic stools have a lot of expectations from them. So is the Varier Move Stool as good as expected? There are not too many adjustable stools which can be as customized. However, the Varier Move Stool is still as up to date as it was when it was designed decades ago. It comes as one of the best options for those seeking a comfortable environment which encourages movement. 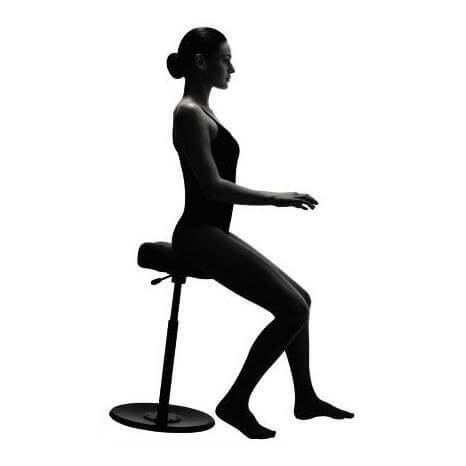 Its biggest attraction compared to a regular stool is that it shift the center of gravity from the torso to the legs. As a result, it needs no backrest and it is also ready to improve sitting posture for most people. It is why it can be an option for those who are already facing lower back pain at work and who want to improve the situation as soon as possible. With a swivel function, the seat is as adjustable as many people would hope for. It represents a viable solution for those who work in in the front and in the back. Large office spaces such as those of scientists or public service areas where workers need to attend a front and a back window are just a few examples of where its design could make a difference. But the ergonomic design of the stool makes it stand out even more. While there are other adjustable stools, not many of them are actually made with ergonomics in mind. For the purpose of proper anatomic support, the stool is as reliable as people would hope for, especially in the conditions in which it improves posture. There is adjustable height to consider as well. It is this function which actually allows users to create their own comfortable working environment even with a stool. Selecting the proper height is important, especially when it comes to added leg comfort. Furthermore, the height adjustability means the stool can be used at a bar or at the table when having breakfast. It can also be used at work with a height-adjustable desk. At the same time, the stool might be considered by artists and musicians. Even if it was designed years ago, the Varier Move Stool’s design is still up to date. One of the areas in which this can be seen comes with its rubberized surface under the seat. It is this material which allows the stool to be easily hanged at the side of a table. Users can vacuum their work area without any obstacles as a result. 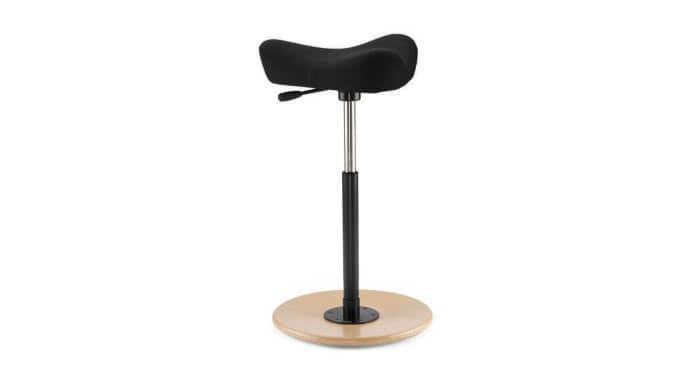 While the tilting function of the stool is not as pronounced as those of its competitors, it still allows users to be more dynamic while seated. The Move Stool is as versatile as most users expect as it allows tilting and a working position which still enjoys a straight spine in various angles. There is a wooden round base which allows this to happen. With so much movement, it is just a matter of time before many people start seeing improved core strength. With stronger back muscles, there is a base on which to build a posture which excludes back pain. Another difference is made on the factory line. The Varier Move Stool is made in Europe to high standards. It actually follows a process which minimizes waste and unusable materials. It is why those worried about sustainability can consider the Move Stool as their first option, especially if they are already part of the environmentally-conscious mindset. 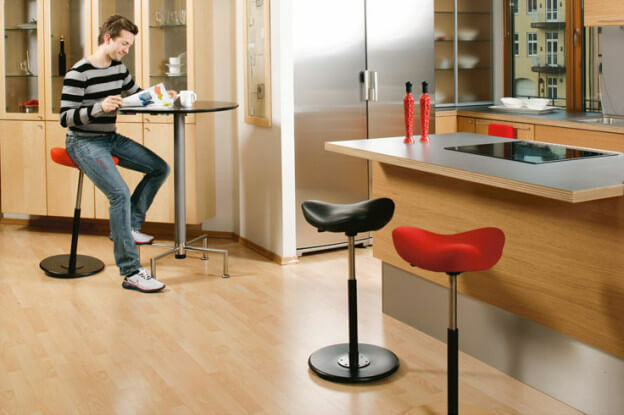 Suitable for adults and children, the stool can be used anywhere in the home or at the office. At its standard option, it comes with height adjustability in the 56 to the 82cm segment. It makes it one of the most adjustable options in its class. Those who want to have a half-standing and half-sitting position can consider it for reception work, in retail or even at the doctor’s office. One of the issues which come up often refers to the comfort of the stool. Even if it comes with a thicker cushioning than its rivals, it is still not comfortable for a full day of sitting. But by far, the biggest possible issue comes with the pronounced profile of the seat. It comes with a daring design which only fits the average user. Larger users might have a problem finding the right spot and proper comfort while seated. Another possible problem based on this design comes with upright forward leaning. As the body shifts towards the edge of the sit, the seating area becomes smaller. With a triangle-shaped design similar to those of a bike’s saddle, the most comfort is achieved when seated towards the back of the stool. It is why the Varier Move Stool should be close enough to the desk not to require users to lean forward. Furthermore, it is also advisable to avoid sitting in this possible posture for too long. The Move Stool can be considered in any location. Its profile would see it as perfect for the office but it even works at home or in retail. However, users need to decide quickly on the saddle design in order to establish if the stool is right for them. This is its main advantage and it’s also its major weakness. For this reason, the stool represents a viable option when it comes to ergonomics, but only for the average body. This makes the Move Stool suitable for adults and children. It represents a viable solution for extra durability, especially in the conditions in which it is used according to the height. The base can also be customized for a more distinct look. It can come with a natural wooden look as standard or with black lacquer, gray or white finish. The fabric can also be customized in color. But the seat can also come in a textile or leather cover. A few accessories can also be added to the pack. A rubberized base can be added to the stool, as it doesn’t come as standard. At the same time, the modern approach of the stool can be seen in the Varier Glow tracker. The tracker looks at the sitting style and statistics of each user. It makes recommendations which can then be used to improve sitting habits. Unlike the Motion stool, the Move Stool is actually compact. It has a versatility which can place it in the kids’ room or even in the office for adults. It is why the Varier is truly varied and it lives up to its name. Even the manufacturer states that the stool comes with a learning curve. It is not similar to any other chair which is made for 8 to 10 hours of sitting. Users need to say goodbye to backrests and armrests. At the same time, it is actually made to improve posture and it can do this by first improving the posture muscles of the torso. At $499, the Varier Move Stool is not the most affordable option in its class. In fact, it is among the most expensive wobble stools on offer. It is why users need to define if they fall into one of the following categories to establish if the stool is right for them. Only people experiencing back pain can truly know the extent of the problem. Those who go through back pain often are those who can benefit from the Move Stool the most. Instead of offering a back massage like other chairs, the stool actually tackles the problem from the inside. It makes the muscles of the back work extra to develop more strength. The more strength these muscles have, the easier it is for them to support the upper body. At the same time, this also develops core balance. Many sedentary workers lose their core strength in time. But this can be gained back to a certain degree and activating the area is the first step in this direction. Some users need to move and rotate around the desk and their workspace. Other might need to turn completely to reach folders or customers. This group of people can make the most of the swivel design of the Move Stool. Furthermore, they might also need to go through a learning period but in the end, the stool proves to be both comfortable and practical. Without actually having to stand, users, can have the 360 practicality. The Move Stool is not affordable by any standards. But since it is still here from 1985, it goes to show just how useful it is. Without complicated designs, it tackles the problem of posture quickly. It also allows users to rotate around the workspace. At the same time, it’s also worth applauding the customization options of the stool. Not many brands go to this extent when it comes to offering a tailored solution. With designs which can even cover kids’ needs, the stool is truly capable to live up to the best options among its competition. With upholstery made from 100% recycled polyester, the stool is also a future-proof design, with awareness on environmental problems. Most importantly, the Move Stool challenges the norms, just as all Varier products. Sitting strong and standing easy is indeed the result. With an engaged sitting position, standing becomes even easier. All users of the stool can consider it in a combination with a regular chair and use in a beneficial sit-stand working approach.